This figure was renamed to the more PC Star Destroyer Commander on The Empire Strikes Back cards and has stayed as such on every card printed afterwards. Comments: Though this figure became better known as Star Destroyer Commander, he was introduced to the original Star Wars Generation as Death Squad Commander. It didn?t take long for Kenner to reevaluate its macabre name selection and in a truly Orwellian manner ?New Speaked? it to the name ?it always was called?. And they would have gotten away with it too if it weren?t for this pesky introduction! 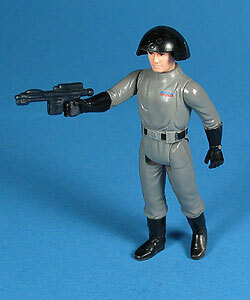 Major Variations: Though all vintage figures have minor variations, the Death Squad Commander has no major variations.